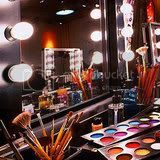 Everyone wants to know how to get started in the makeup field,but are unsure how. There are so many avenues you can take,so you must first discover where your true passion lies. -Do you want to be a special FX (effects) artist? -Do you want to work as a freelancer (doing bridal + photoshoot gigs)? -Do you want to work in retail at a cosmetic counter? -Do you want you want to work as a funeral home makeup artist? -Do you want to work as a permanent makeup artist? -Do you want to work in the film/photography realm? -Do you want to work as a camouflage makeup artist in doctors offices/medispas? The easiest way to get access into the beauty world is to obtain a license of some sort. Whether it be an esthetician (skin care),cosmetology,or other licensing,this will help get your foot in the door. It shows you truly are passionate about learning how to further your career. Both Skin care school as well as cosmetology,offer courses in makeup,but Skin care school would be more in depth than cosmetology. Once you have a license,you will have learned proper sanitation procedures,basic application,analyzing skin types/face shapes,complimentary colors,and so much more. It does go beyond that,however..you will need additional specialized training to learn some key techniques.Blending is a very important element in eyeshadow & face makeup-which takes time to learn.Practicing on face charts provided by different cosmetic counters would be a good way to learn,also practice makeovers on a variety of skin tones,ethnicity's,and take pictures to build a portfolio! You can attend an annual yearly makeup seminar to take classes,take some airbrush classes,even department stores often have technique classes which have valuable information. Also,once you have a license,you can get a professional discount on many cosmetic lines-for example,MAC Pro.com you can get 30-40% discount depending on your license/job title,etc.